MartinLogan is famous for some of the most absurdly expensive sound gear that normal humans would never ever consider buying. Like a lot of legacy audio companies, ML is now trying its hand at personal sound, starting with these lovely little buds. They're impressive, but they're designed disposable. $150 in-ear monitors (~earbuds) designed by an audiophile brand name that's new to the headphone game. Discerning music fans who are willing to shell out for little speakers that fit in their ears. Slim, one-inch-long cylindrical sound tubes that slide into your ear canal and fit snug with your choice of jelly ear tips. Put them in your ears and push play on your phone, or on the Apple-friendly three-button remote. MartinLogan even conveniently labeled the ear tips for you: The red bud goes in right ear, the white goes in your left. Full-bodied sound in a lightweight comfortable package. The cables are so slim and round and light that they get chaotically tangled every time you pull the buds out of your pocket—even when you've taken care to wind them up right and store them in the included carrying case. And unlike other similarly priced gear, you can't replace the cables. So once they're worn, they're gone. The slim, cantilevered design looks different from other in-ear buds. In a good way. Tested for over a month around the city using the music on my phone. The Mikros 70 IEMs reproduce recordings accurately, with clarity across tonal frequencies and a dizzying two-channel split. More brands should try out this design. The buds stay put in your ears even when you're running around like a crazy person. We're very fond of these little guys, but they're a bit of a splurge. 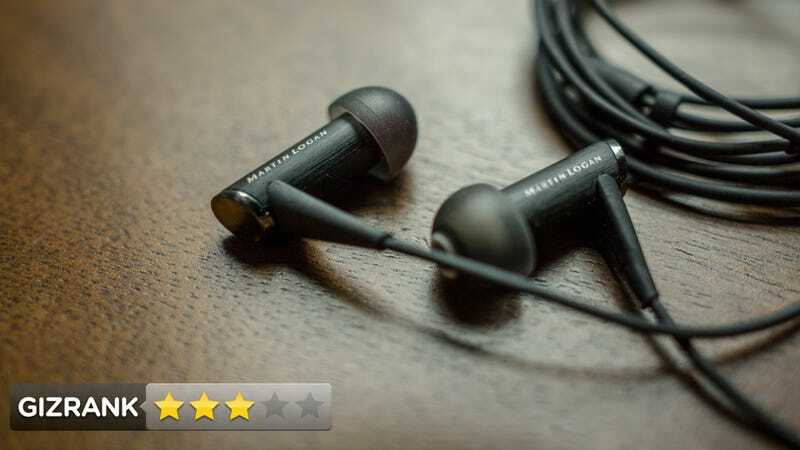 The Mikros 70 sound excellent, and the design of the buds themselves is elegant, but you can't replace the cables and who knows how long those dinky easily tangled wires will last. For $150, you should get more than just another throwaway. But if you're very gentle with your stuff, go for it. They're a joy as long as they last.